#ad: A FabFitFun Box was provided for Editorial Consideration. I am a member of the #FFFVIP program. 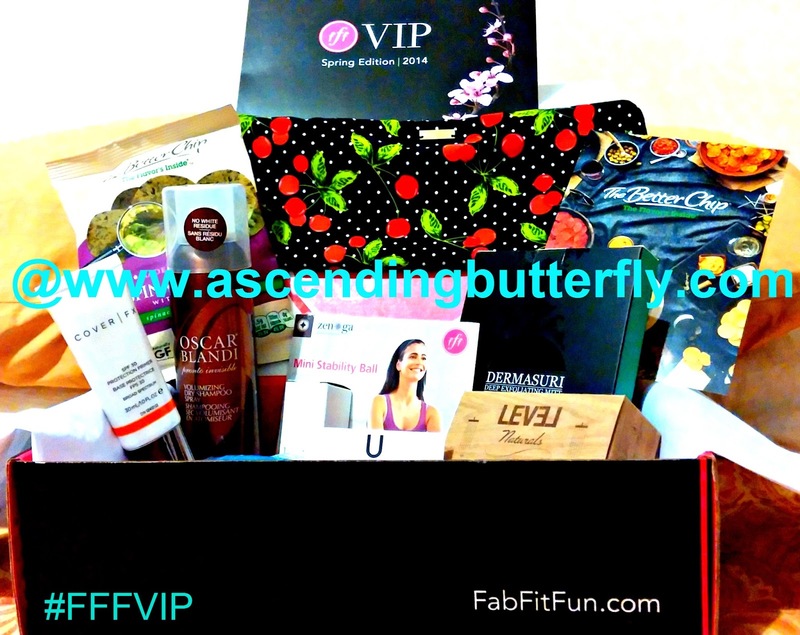 I am a FabFitFun VIP Member and recently received their Spring 2014 Box. Here is a review on the last box I received. I had the chance to attend a live tweet up last year with Giuliana Rancic and co-host a twitter party in conjunction with the P&G #GIVEHope 'Do it for the Girls' campaign. If you missed that post, you can check it out HERE. Meeting Giuliana in person and hearing her story inspired me because there is a history of Cancer in my family, to get my first ever Mammogram early. Cancer does NOT discriminate and youth is not a shield against it! Giuliana developed a subscription box service called FabFitFun where she curates a collection of great products spanning beauty, wellness, health, fitness and fashion to help you feel good from the inside out (which of course is very much our motto here at Ascending Butterfly!). Out of ideas on what to get mom this year? How about a FabFitFun Box Subscription? It's a gift that will let her know you are thinking of her YEAR ROUND, not just one day of the year. And the box spans such a wide product range it will help her find new favorites! "It's the perfect way to kickstart your happy and get more from life every day!" Spring 2014 FabFitFun Box - I propped it up on my bed in front of my pillows so I could feel like it was a welcome basket from a Spa! Ƹ̵̡Ӝ̵̨̄Ʒ - Cover | FX SPF 30 Protection Primer - ARV $38 - I love priming my skin especially before using a powder/mineral foundation. Ƹ̵̡Ӝ̵̨̄Ʒ - Mini Stability Ball and Breathing & Muscular Release DVD System - ARV $28.94 - This is going to really help me kickstart my Spring Fitness Routines, I was super excited to find this one in my FabFitFun Box! Ƹ̵̡Ӝ̵̨̄Ʒ - Dermasuri Deep Exfoliating Mitt - ARV $19.99 - This is actually a body scrub AND body treatment. The unique fabric sloughs off dead skin cells, making the skin surface ready for even tanning as well as self-tanning products, improves circulation, stimulates collagen production which fights aging skin appearance and it also evens skin tone to prevent dullness. (Also gentle enough to use post sunburn to slough off the peeling skin!) I am BIG on body exfoliation followed by a body oil when my skin is still warm and then a body butter later in the evening. I have to admit I am a bit obsessed with this mitt! Ƹ̵̡Ӝ̵̨̄Ʒ - Cult Gaia Turband - ARV $48 - I have honestly never worn a Turban, so we'll see how this works out but mine has a 'cherries' pattern on it, I'm more of an animal print person myself (I think the 'Ally' would have been more me or butterflies of course, but I don't see anything with Butterflies on them) - These are lined with wire so they are bendable and totally adjustable! And I love that they are HANDMADE in Los Angeles. Ƹ̵̡Ӝ̵̨̄Ʒ - Oscar Blandi Pronto Dry Shampoo Invisible Spray - ARV $25 - Nothing extends the life of a quality blow-out better than a good Dry Shampoo. I was a bit of a late comer to this trend, but I am finally getting what all the buzz is about. Particularly as my hair is super long right now, so when I get a blow out done I love having a way to extend the life of it. This one sprays clear, removes excess oil and product build-up, boosts volume and has gentle starches and Vitamin E and Wheat Proteins which strengthen and protect the hair. It uses Lemon Verbena to provide a fresh, clean fragrance. Ƹ̵̡Ӝ̵̨̄Ʒ - Level Naturals Shower Bombs - ARV $7.99, Four Pack - Think of these as a Bath Bomb's kid sister. You drop one of these at the bottom of the shower near your feet under direct water away from the drain and allow the Organic Menthol and Eucalyptus to clear your mind, while the Tea Tree essential oils help your tired feet at the same time! It's a quick Aromatherapy Home Spa Session! Ƹ̵̡Ӝ̵̨̄Ʒ - The Better Chip Spinach and Kale with Sea Salt - ARV $1.99 - These are great to have in the pantry to help conquer those 'savory' cravings with something that offers the same bold flavor with a lot less fat! The best things about a subscription box is discovering a great new product, or a brand that is new to you. And what is better than finding a product new to you from a brand you already love? What mom wouldn't love to know you are thinking about them year round? It's actually difficult to pick a favorite this time around, but I have always wanted a stability ball and I keep saying I'm going to pick one up and forget, so I'm really excited to finally have one and try to incorporate it into my fitness plan to gear up for summer! I have already got the perfect new swimsuit (more details on that soon I promise), so I need to get it in gear before I hit the beaches this summer! I provided URL's to all the brands above in the list of contents so you could get social with them as well, but don't forget to get social with FabFitFun too! I'm definitely looking forward to trying out my next box (I hear the summer box is going to be pretty awesome too! and if you follow them on facebook you'll get some spoilers! ), and this would definitely be a thoughtful gift for someone you know who is in the hospital or home getting treatments, I know this would have put a smile on my face while I was in the hospital during most of 2012 that's for sure. (And remember some floors do not allow patients to have flowers and some patients also have food restrictions, but usually beauty products are not banned, just call ahead to be sure). Which of these products would you most like to try? Which is your favorite subscription Beauty Box Service and why? FTC Disclosure: I received a FabFitFun Spring 2014 Subscription Box for Editorial Consideration, however all opinions are 100% my own. I am disclosing this in accordance with the Federal Trade Commission 16 CFR, Part 255 - Guides Concerning the use of endorsements and testimonials in advertising, you may visit our full giveaway and disclosure page for complete policy information. This post contains affiliate links. I love this idea.I love finding new products and what better way to do it ! A little love all though the year ! @Big Happy Buddha - This is a great way to find new products and start with a full size so if you love it, you have enough of it to last until you can purchase! What a great box! I have been dying to get some dry shampoo, my hair is long and thick and I hate shampooing daily. Adds too much drying time. I might try the brand you mentioned here. Thanks! @Karen - Dry Shampoo is a lifesaver for preserving a good blowout! This is a GREAT one and I've tried quite a few. I also have long hair, but super thin, so washing everyday is not ideal for me either because I lose a lot of volume that way. I also use dry conditioners! What a great idea for a Mother's day gift. I think it would be like Christmas every month when you got your package! @Cynthia - That is it EXACTLY! You nailed it. For me subscription box services do feel so much like Christmas, always something NEW to surprise and delight! This is great and I always love a coupon, it encourages me to try it out. Wow! Such great products! I want the exfoliating mitt! But would appreciate the entire box! @Lexie - When it comes to skincare I'm an exfoliation product junkie and a body butter and body oil FREAK! I'm always game to try out anything in those categories. I featured another really great skin exfoliating product awhile back, the giveaway is now closed but I do also recommend this one: http://www.ascendingbutterfly.com/2010/12/win-best-shower-youve-ever-had-usa.html <-They are called 'Salux Cloths' These will also rock your socks! I love subscription boxes -- they're like getting surprise gifts every month! Will have to check out this one! Who doesn't like surprise gifts? Especially every month right? I am already done with my mother's day shopping, but I would love some of that Spinach and Kale with Sea Salt! @Masshole Mommy - These also make stellar Graduation Gifts for a special Young Lady in your life! The Better Chip's Spinach and Kale with Sea Salt Chips are such a great way to keep the savory cravings at bay in a healthier way. I am glad I got to try them out this way and will be re-buying that's for sure! What a fun box. I appreciate it when I get new goodies to try as well. I want to check out the Dermasuri Deep Exfoliating Mitt. @Frugal and Fun Mom - When it comes to skincare I'm an exfoliation product junkie and a body butter and body oil FREAK! I'm always game to try out anything in those categories. I featured another really great skin exfoliating product awhile back, the giveaway is now closed but I do also recommend this one: http://www.ascendingbutterfly.com/2010/12/win-best-shower-youve-ever-had-usa.html <-They are called 'Salux Cloths' These will also rock your socks! I've never heard of FabFitFun before, but it sounds like a great way to check out new products! @Confessions of a Coupon Queen - Glad I could introduce you FabFitFun, the boxes retail value are always more than double what you paid for it, so it's a great value, and the curated picks are always fun! This looks like a great box and gift idea for mom. I love the shampoo. @Jessica - These boxes would make a perfect gift for mom! That is one cool box! I'd love to find that on my doorstep! This sounds like a great box and a fun way to try new products. @Angela - Subscription boxes are a great way to try out something new! I've gotten kids' subscription boxes, but never one for me. I think I need to change that! This mama could use some TLC! I love those subscription boxes. I'd really love to get the dry shampoo, though. I've always wanted to have some on hand for those times you can't wash your hair, but it needs some attention! I love the products in this offer. I might just have to forward this post to my kids. @Danielle Leigh - Be sure to press on the banner above, you'll nab your first box at a discount and I'm sure you'll want to keep getting them! I love Kai perfume! I can't believe you received all of this in the box - sounds like a great subscription. Would be fun for college kids too! @Danielle - We have a coupon to nab this one with an additional $5 off, a perfect way to try it out! @debdenny - Let us know if you try them out! I love subscription boxes for the same reason. I love finding new things that I might not have found otherwise. @Debi - That's why our editorial team loves trying out Subscription Box Services, there is literally something for everyone! This is so cool and a perfect gift! @Lisa - We agree! The first box is all it takes, these are really well curated! This box is full of some really nice things. It makes me once again appreciate the beauty of subscriiption boxes. @Janeane - Fab Fit Fun boxes are really well curated, and when you follow them via Social Media you get a sense about the rhyme and reason to why each item is picked, and pictures of the Founder (Giuliana Rancic) as she meets with each brand and sports each item herself which is another reason they stand out!